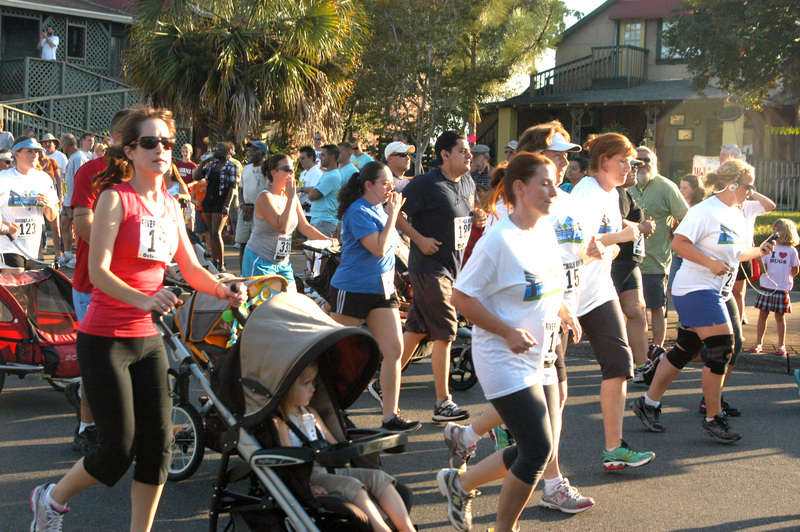 It is time to register for the Riverwalk Run 5K 2015, which runs through historic downtown Milton, Fla., at 6 p.m. on Saturday Oct. 3. This certified 5K (3.1 miles) course afternoon run will offer the chance for three lucky people to win $250. Two of the $250 prizes will be if a man or woman breaks the course record. The men’s records stands at 15:46 and was set by Nate Crum in 2011. Crum had recently moved to Milton and served aboard NAS Whiting Field. He was a late entry for the race after he saw the registration sheet while paying his utility deposit. The women’s record is held by Milton High School teacher Susan Smith. Smith, an avid 5K competitor in the area and region, set the women’s mark of 20:12 back in 2013. The third way to win doesn’t matter how fast or slow you complete the course. The ticket to win $250 is your bib number, but you do have to be present after the race is concluded and the awards are presented. One runner, walker, or wheelchair participant will have their bib number randomly drawn at the awards ceremony after the race and will win $250. “Regardless of skill level, we want to make sure everyone has an opportunity to win,” said Kyle Kemp, the Riverwalk Run 5K Race Director and Event Coordinator for the City of Milton Parks Department. You not only have to participate; you must register as well. Registration for the Riverwalk Run 5K this year is being done online at www.runsignup.com/race/fl/milton/riverwalkrun5K through Sept. 28. The fee is $20 online, which includes a shirt. Please be reminded that no paper forms will be accepted, so please do not mail-in your registration/payment. If you register for the Riverwalk Run 5K online after July 31 the registration fee will increase to $25, which includes a race shirt. On or after Sept. 29, if you wish sign up you must sign up at a package pickup site, which will be announced at a later date. Registration fee includes a T-shirt and race bag to the first 500 people to pick up their packet, as well as post-race refreshments. Race day registration is $25 at the Riverwalk Pavilion on S. Willing St. next to the Santa Rosa County Veteran’s Memorial Plaza, but shirts at this time will not be guaranteed. All participants registered by Sept. 4 are guaranteed Milton Riverwalk Run 5K T-shirt. Strollers are welcome in the Riverwalk Run 5K, but there may be some areas along the course that are difficult to get through with one, especially being the section along the Riverwalk Boardwalk which can be a little bumpy and narrow at the entrance and exit. For more information on the Milton Riverwalk Run 5K you can go online at www.miltonparks.wix.com/2015riverwalkrun or contact the Milton Parks and Recreation Department at 983-5466.